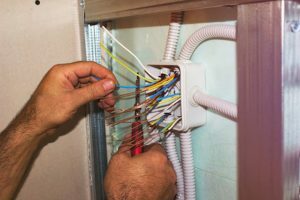 Choosing the right Woodstock electricians to handle your commercial or residential electrical needs is a big decision, and one that can be somewhat overwhelming. After all, there are many electricians in the Woodstock area—how do you hire the best? You will want to find one you can trust has the professional skills, experience and training necessary to get your jobs done right the first time. At Bryan Electric, Inc., we are proud to be serving Woodstock and the surrounding communities with expert electrical services. Our staff features qualified, highly trained technicians who have a proven track record of successful electrical work. From the first call to our office to project completion, you will know you have made the right choice by hiring our team of experts. What to Expect when You Work with the Team of Woodstock Electricians at Bryan Electric, Inc.
● Advanced equipment and tools to thoroughly assess your electrical system. ● A customized plan to repair and maintain your system so it functions optimally—you’ll get no “cookie-cutter” electrical services when you work with Bryan Electric! ● Inspections to help you catch electrical problems before they become more expensive and dangerous. ● Expert services designed to extend the lifespan of your system and help you to conserve energy and cut costs when possible. ● Follow-up service and tips to help you make the most of your electrical system. ● Friendly, attentive customer service during each and every phone call and appointment—your satisfaction is our top priority. Services Available through Bryan Electric, Inc. If you live in the Woodstock area, you’ll be happy to know we offer a full-range of comprehensive electrical services to all residential and commercial customers. If the service you need isn’t on this list below, contact us and we will let you know how we will meet your specific request. With all of our specialized services, we use infrared thermal inspections that enable us to get a closer look at what is really going on in your system. This in-depth view can help us to increase the efficiency of your system, adding years of life to your system’s switchgear panels and warning of electrical problems that need immediate attention. While a safe and well-working electrical system is likely one of your top electrical concerns as a homeowner or business owner, being able to cut down energy usage and cost definitely couldn’t hurt! The good news is with Bryan Electric working for you, you can achieve all of those goals. Our professional energy audits help you to see where you could be wasting energy and identify practical solutions you can incorporate to start saving when it comes to energy consumption. Let our audits help you to fine-tune how electricity is working in your home or business, so you can make the most of it. Expert preventative maintenance will help you to avoid the need for emergency services in the first place. Still, there may be a time when you need a Woodstock electrician at your home or business immediately. Having to wait for office hours is not okay during a potentially dangerous electrical situation. That’s why, we offer emergency electrical services 24 hours a day, 7 days a week. Whether you are in the middle of a holiday meal with family or have an emergency at midnight, our team of Woodstock electricians will be there to ensure your electrical system is safe and working properly. This service provides tremendous peace of mind for home and business owners. Whether your home or business requires electrical repairs, installation, or you want to set up preventative maintenance, our team at Bryan Electric, Inc., is ready to handle your job. Contact our Woodstock electricians today online or call (770) 680-2144 to learn more about our energy audits or any other of our professional services designed to keep your electrical systems safe and functioning optimally.